REVIEW OF THE BRAVE GORILLA. This book was a very good example for keeping promises or taking risks. 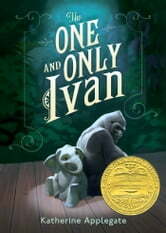 This isa sad book but soon... You will find out whst Ivan truly is, not just a gorilla. The One and Only Ivan is a heartwarming story that speaks without words. It puts you into a different mindset; the mindset of the silverback gorrilla Ivan. Through the story, we see Ivan go through life in his cage in the most simple and carefree minded fashion, as he fights for hapiness and wellbeing, and to go, once again, outside. This will be a great read aloud for children! So many ways to connect this book to bigger issues: conservation, zoos, art as expression, nonverbal communication, friendship. 4 stars because it was hard to “get into” at the beginning for me. It was an amazing book!It was kind of sad ,(like any good book),but it turned out to better than I thought!